I remember eating this chicken as a child, wondering how on earth my mom managed to make the most delicious chicken on earth when she was only in the kitchen for around 10 minutes. I loved how the glaze would stick to my fingers and I had to lick my fingers to get it off. When I say this is sticky, I mean it’s REALLY sticky. And you would never guess which ingredients have been used to make the glaze. I thought my mom was quite the visionary at first but then realised that this is a very popular way to cook chicken. In South Africa, at least. When I first tried her recipe around a month ago, I was dead certain that it wouldn’t work. 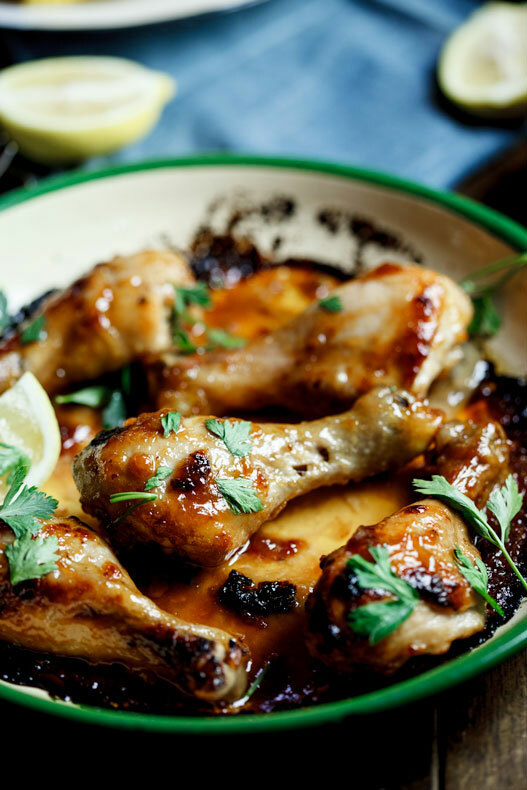 After all, who could guess that mayonnaise, chutney and lemon juice could create a bake-in sauce that would result in the most delicious, easiest chicken? But I trusted my mom’s recipe and went ahead. When I opened the oven, I was met with gloriously golden, sticky chicken and I have to say it again, it was absolutely scrumptious. The twins gobbled it up eating 3 drumsticks each! C (who doesn’t like chicken, by the way) lapped it up and I’ve been making it every week since then. When my dad first tasted it, he was so chuffed that I had recreated my mom’s tried-and-tested chicken. I can guarantee that you will not have a single piece of chicken left when making this. And this is, most definitely, the easiest chicken recipe I’ve ever made. You stir the ingredients together, tip it over the chicken and pop it into the oven. I served the chicken with steamed broccoli tossed in lemon juice and olive oil and super sweet mielies (sweetcorn). A great mid-week meal. 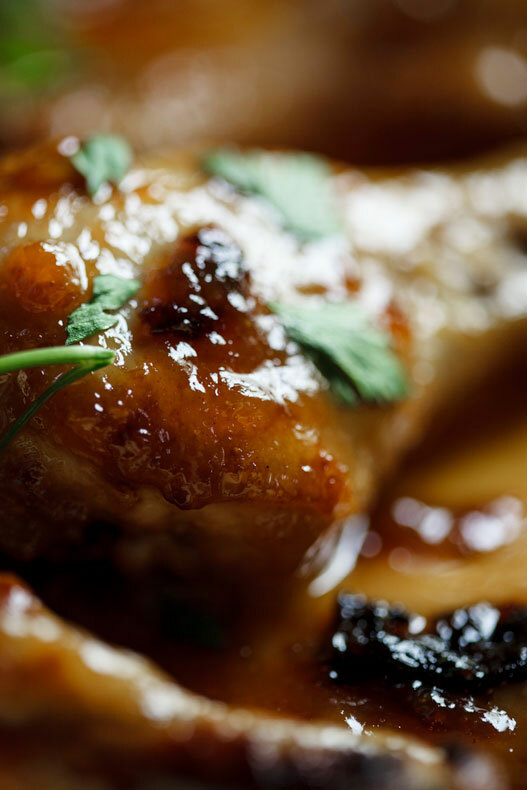 Place the chicken in an oven-proof baking dish. Whisk together the mayonnaise, chutney, lemon juice, salt and water and pour over the chicken. Any sweet sauce will work. Sweet chilli sauce is a good substitute. I’m so glad you like it Thando! 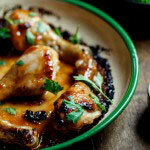 I didn’t have tangy mayo – so I used Nando’s Perinaise – just fab! 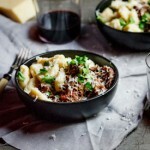 Thanks so much for the recipe – we are having this for dinner again tomorrow night. Yum, the Perinaise sounds like a great addition. So glad you like this recipe Heather. Do you cover with foil while baking? Can’t wait to try this looks amazing. Nope, I just bake as is. I’ve never frozen it before so won’t be able to say. I don’t think the glaze would freeze too well, to be honest. Looks good. Does it freeze well? Do you pour all of the sauce over the chicken? 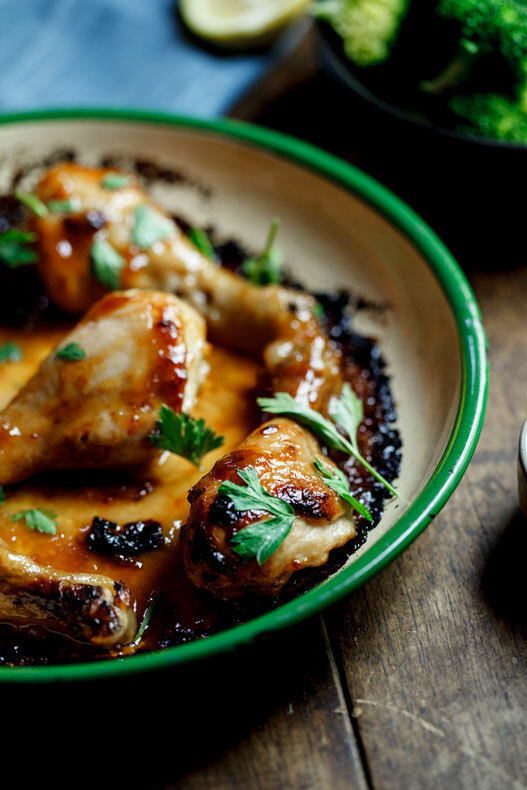 I just tried making this, and after 40 minutes had to spoon most of the sauce out of the dish because the chicken was still swimming in it, no where close to becoming sticky… I was using US cup measurements, if that makes a difference. Thanks! Kate, yes you use all the sauce. Was your chicken frozen before you made this? That sometimes makes a difference as the chicken releases a lot of water during the cooking process if it was previously frozen. 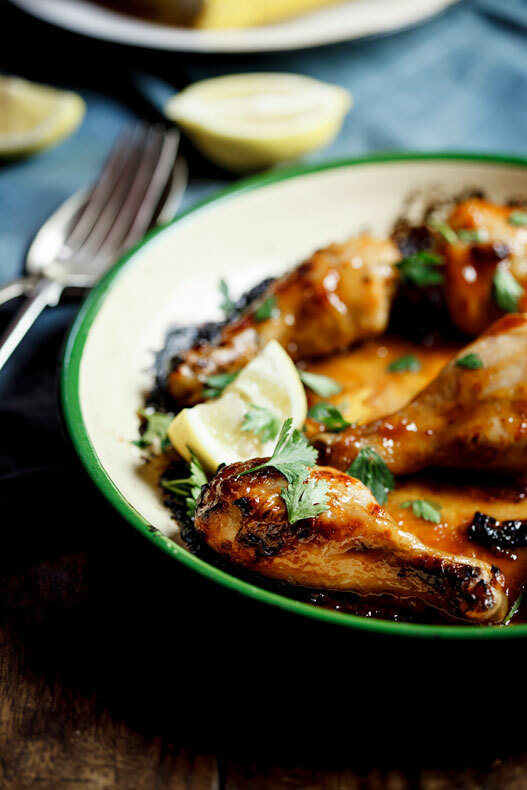 If your chicken wasn’t frozen beforehand, all ovens are different and you might need to turn your temperature up quite a bit to allow the sauce to caramelise and go sticky. Zoe, tangy mayonnaise is mayo we buy in jars/bottles in South Africa. It’s not as creamy as Hellmans for instance and a little ‘looser’ in texture. 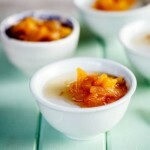 Peach chutney is a sweet relish of sorts made from peaches and can include other fruit as well. Mango chutney, if you can find it, will be as good. What is tangy mayonnaise? I’m not sure you can get it in England. Also peach chutney? made this a few times for my kids and my son LOVES it. one of his favourite meals. made it for my neighbour for her xmas eve dinner present and she cant stop making it aswell. got it in the oven right now 🙂 so simple and tastes amazing!!!! What kind of mayonnaise did you buy? I used a tangy mayonnaise. I want to say that in the US, this tangy Mayo might go by the name Miracle Whip. Any thoughts on this idea? Becky, you could use miracle whip but the mayo I used was less sweet, more tangy in flavour and a little runnier so not so thick and whipped in texture. Any issues with taking the skin off when baking it? Would the instructions be the same? We try to avoid eating chicken skin for health reasons. Kat, the end result won’t be the same but you can use skinless chicken if you prefer. I normally just serve it with a salad or some steamed broccoli. 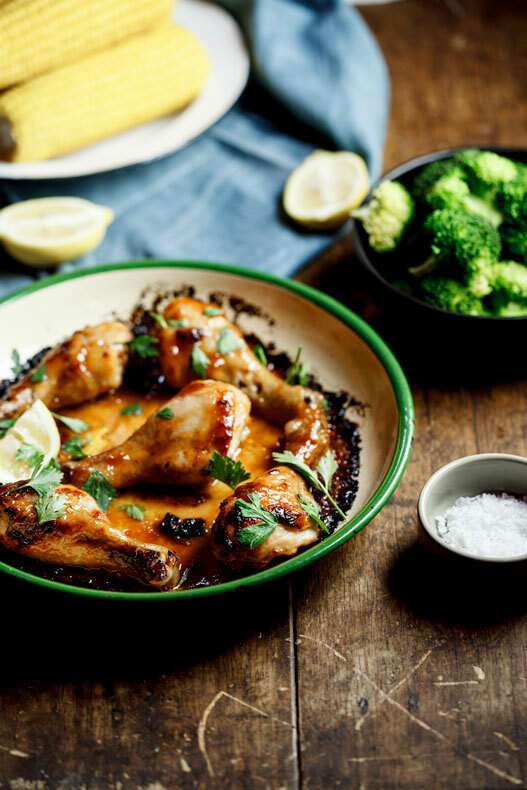 What do you serve with Sticky Chicken? Thanks for the recipe. For some reason, mine was quite raw after 40 minutes of baking; I needed to leave it in about 50-55 mins. Is this for real? it’s brilliant!! Thanks for sharing. Hi! I’m wondering if there is a way to make tangy mayo in case I can’t find it in stores? Thanks! Sydney, as long as you don’t buy salad cream (Miracle Whip style mayo) you should be fine. I’m making this dish for the first time today. I couldn’t find peach chutney though so I got mango chutney instead. I hope it works out well! I’m sure Mango chutney will work just fine Nina! I hope you enjoy it! The lemon adds a lovely tang! Hi how much lemon juice do u use? I adore time saving recipes like these. Thanks! I made this last night, it was delicious. amazing pictures on the blog. i love chicken and would definitely try this out. Sweet and sticky ? What’s not to like. Thank you for sharing..
Hi there, We also used to make this chicken recipe – I think it was off the back of a mayo or chutney bottle. It is delish!